Construction and Engineering related works are taking place at a large scale in Bangladesh in almost all sectors Legal assistance of procurement works of various construction of different public projects under G2G, PPP or other modes for bridges, power plants, LNG terminals, roads, flyover, railways, dams, seaport, river port are frequently required etc. (For additional information please see: Procurement, Bidding and Government contracts). On the other hand, legal works for power, energy and infrastructure projects which are not confined to procurement are also frequently required. (For additional information please see: Power, Energy and Infrastructure Projects). The private sectors are also involved in constructing a warehouse, factory, shopping centers, business centers etc under private initiatives Legal services in this sector is required both by the employer and contractor, whether local and foreign companies. The services often involve due diligence, preparing construction agreements, and sub-contracting agreement etc. Construction related disputes resolution is increasing due to an increase in the volume of transactions. Due to the presence of arbitration clauses in construction agreement and applicable laws, the matters often settled through arbitration and mediation. As a one of the leading law firm of the country, we are engaged in helping the client by providing all kind of legal support they need. Rahman’s Chambers with respected Chinese clients after signing construction agreement drafted by Chambers. 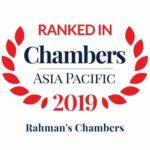 Rahman’s Chambers completed its ninth year in serving clients in the area of Construction and Engineering. We are experienced, competent and capable of dealing with any issues involving this area of practice. Our clients, either employer, joint venture partner or contractor, are both local and foreign companies. We also handled numerous construction arbitration in recent years mostly as counsel. Our assistance is required in almost all stages of the project’s life cycle by main contractor, subcontractor, owner etc. Advised a leading Japanese company and drafted construction agreement for the boundary, soil improvement, water excavation, etc. work involving their existing factory in an Export Processing Zone. Drafted subcontract agreement for the importation of crushed stone for different projects in Chittagong for a Chinese company. Provided legal consultancy involving architectural design & drawing work of a construction project for a renowned architectural firm. Provided legal consultancy & drafted master agreement for construction of several projects, and also individual project agreement for a subsidiary of Pou Chen Group, Bangladesh Pou Hung Industrial Ltd., at Karnaphuli Export Processing Zone (KEPZ), Chittagong. Advised & drafted agreement regarding the architectural & structural project for the employer for a 25 storied hospital. Drafted EPC contract for a major Japanese company as employer for construction of captive power plant. Represented Quality Timber Industries Limited in a construction arbitration involving delay, etc. of construction works against the contractor. Drafting construction agreement for building a warehouse for a Chinese Automotive. Appeared in court as local counsel in local Arbitration involving delay & time of construction of a commercial building in Chittagong. Vetted agreement relating to a Dam projects for a Chinese company. Litigation involving feasibility project for Paira Sea Port for a Korean company. Legal consultancy involving EPC and O & M agreement for a major power plant of EGCB. Several litigations involving IPP, Small IPP and rental contracts in High court and the lower court. Legal due diligence is a vital step for working in a construction and engineering project in Bangladesh. It requires in the area of Taxation in particularly available incentives, etc. Besides for import and export of capital machinery temporary import, customs, VAT, due diligence is very important. Clients often request other types of due diligence for example- Company, Land etc. We draft contract signed among shareholders, joint venture partners. Besides, in commercial projects, we draft the main contract signed between the contractor and owner. The Firms vet term loan agreement, project finance documents e.g. Mr. Rahman’s expertise developed in Banking matters while advising in Central Bank for last 10 years as an advising other Banks for similar duration. The contracts with Architect and Engineers are key agreements. We vet such agreements on a regular basis. Major projects require many subcontractors from locally or from abroad. We draft agreement to be signed with subcontractors making it suitable for the project. EPC contract & in major project O & M contract is common in Bangladesh. EPC contract is sometimes known as a turnkey construction contract. Employer after imposing significant liabilities on the contractor for construction delivers complete facilities to the employer. The firm advises client over important terms and conditions, for example, liquidated damages for delay, timing, force majeure, insurance dispute resolution etc. In the construction engineering project the liabilities for the employer towards employee while working at the workplace with regard to personal injury is regulated under the labour laws of Bangladesh. Our ADR and Tribunals department regularly, handle issues involving consoling with labour and defending clients in cases filed in labour court involving personal injury. The Chambers has strong team of lawyers who regularly advise employers, on a several employment issues. Both for labor and non labor, the same law and practice is applicable for construction and engineering projects. In construction matter, the arbitration clause is generally common. Chambers presently representing a construction company in a local arbitration and also an employer in another arbitration over a dispute involving delaying construction, payment, etc. for example Knight Frank, Quality Timber, etc. Article: Construction and Engineering related Disputes in Bangladesh (Vol. 2 of 2015). Article: Should the Developer and the Landowner Execute a Registered Deed of Exchange? (Vol. 1 of 2009).